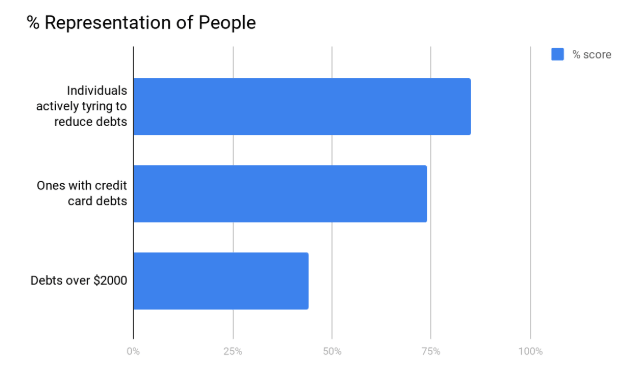 These two, overspending and credit card debts are hard to separate, from the findings in our January 2019 survey, up to 70% of people who took interviewed overspent by not less than $100 each month. Slightly more than 50% also admitted inability to cover in full their credit card bills every month. Despite all these, more than 80% of Americans are actively trying to reduce their outstanding debt burden in 2019. Therefore, Elite Personal Finance has updated statistics on credit card debt in America in relation with overspending to illustrate how much consumers are fairing on. 60% of women compared to 35% of men do not think they can pay off their total credit card debt. It shows a shortage of confidence among women. Midwesterners have more expensive credit card bills compared to other Americans, with 53% of adults in the region having more than $2,000 in credit card debt. Majority of Americans have debt as their dominant strain: About 85% of adults Americans are actively striving to minimize their debt, up to 74% of these have credit card debt in general. It may not be a topic common in many dinner tables; however, credit card debt shall never be a brim point in question. As stated earlier two-thirds of Americans have credit card debt as we speak or in the past. Despite all, the majority of Americans are actively making efforts to minimize the deficit and overspending simultaneously each month in less urgent situations. Below is a graphical representation of the top five things that Americans spend on, each month. 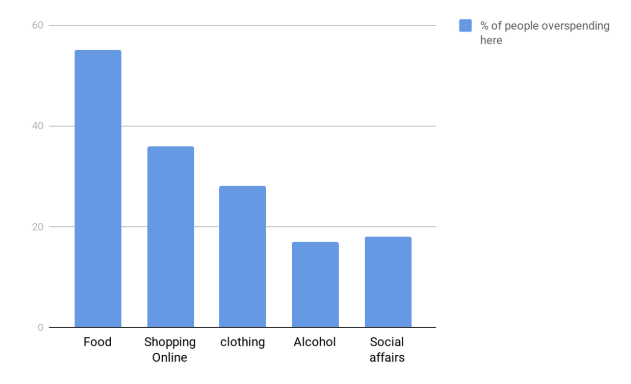 The trends illustrated by the above graphical representation cuts across age groups, genders, and regions; you should note that Americans find it hard the most to hold back their spending on social activities like drinking, partying and many fun related cases; the same goes for shopping online and clothes. The graphs below highlight some of the differences across demographic groups as far as debt management is concerned. 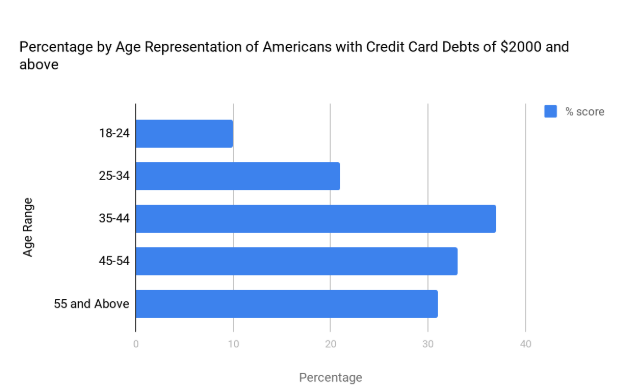 A survey by our experts found that the oldest Americans are the likeliest to have credit card debt (80%), while their younger counterparts the least likely (63%). About 6 out of 10 respondents in the age range of 18 to 24 have credit card debt, while 8 out of 10 respondents who are 55 and above admitted to carrying debt. Less than 1% of respondents’ age range, 18 to 24, reported a credit card debt of more than $5,000. 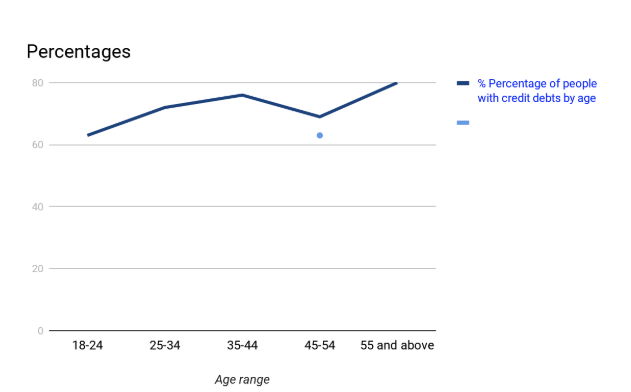 The average balances in that same age range were significantly lower compared to that of older respondents. The difference is the outstanding balances is directly proportional to the difference in income between the two age groups-most young people have less paying jobs as a matter of facts. There is a level of confidence among those with lower balances to pay off their debt immediately as long as they wanted to complete the payments. The older respondent faced by increased responsibilities like mortgages, school fees goes above their credit lines because it is necessary. From our study findings, there is a great deal of evenness in the two genders when it comes to credit card debt. Up to 74% of individuals from both the sexes admitted to having outstanding card balances. From that, we learn that Men and women are equally likely to carry some debt on the least. For all that, there’s a high level of likelihood that women have larger outstanding balances, with about 46% of women reporting total credit card debts of well over $2,000 compared to 42% of men. Therefore, the average self-reported credit card debt among women is $3,484 and $2,980 for men- a deviation of more than $500. Region wise, there was a little variance on the percentage of people with credit card debt. In all the five areas of the U.S., close to 70% or more of the interviewed individuals admitted to having one credit card debt on the least. The Southeast region has the least percentage of residents having account balances over $2,000. The average incomes in this region are also lower, and this attributes to the outstanding card balances and lower purchasing power. In contrary, there is a well over $2000 outstanding balances reported by the residents of the Midwesterners. There are a few obvious but often neglected tips that when put to practice can help you curb the overspending and card debt issues, these can help put yourself on a pathway to financial freedom and success. Overspending might not be so vivid; however, in the end, you might find yourself a victim. To avoid this, it will be indispensable that you prepare a monthly budget. Every month, you must have a full picture of your financial health, this is done by checking your credit score at least once each month. If you want to raise your credit score, see to it that your utilization is below 10% and ensuring timely payments of all your bills. In so doing, you will reduce the cost of borrowing money, since you’ll qualify for lower interest rates. NOTE: The data on this study is as a result of the expert survey from Elite Personal Finance team and compared to the findings of other top financial sites in the US, the study was conducted online on over 1500 Americans in the entire month of January 2019.